She’s Here!! 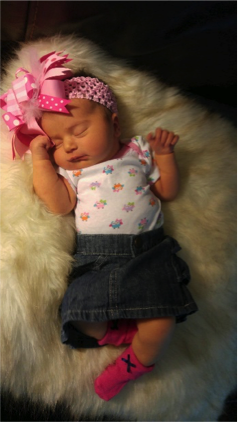 My beautiful granddaughter was born on September 10 and she’s perfect! 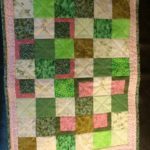 I couldn’t help but share a few baby quilts that I have made for her. 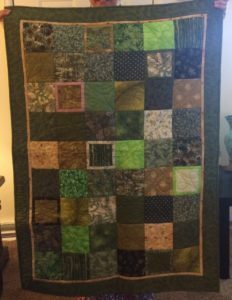 I must say that at first I threatened my daughter that I would make a dozen quilts before Freya Reign was born but was told that she didn’t need that many, so I have revised it to a dozen by the time she is two. 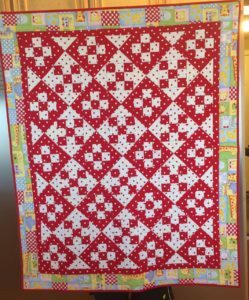 After all baby quilts to a newborn are like shoes to a woman. You can never have enough! 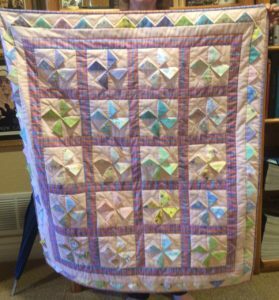 The first one I made was from P.S I Love You Too quilt book (great book for baby quilts and things). Of course knowing she would be a girl I made it in pink. Then my daughter informed me that she didn’t want things in pink and her nursery theme was “Enchanted Forest” and would be mostly greens. 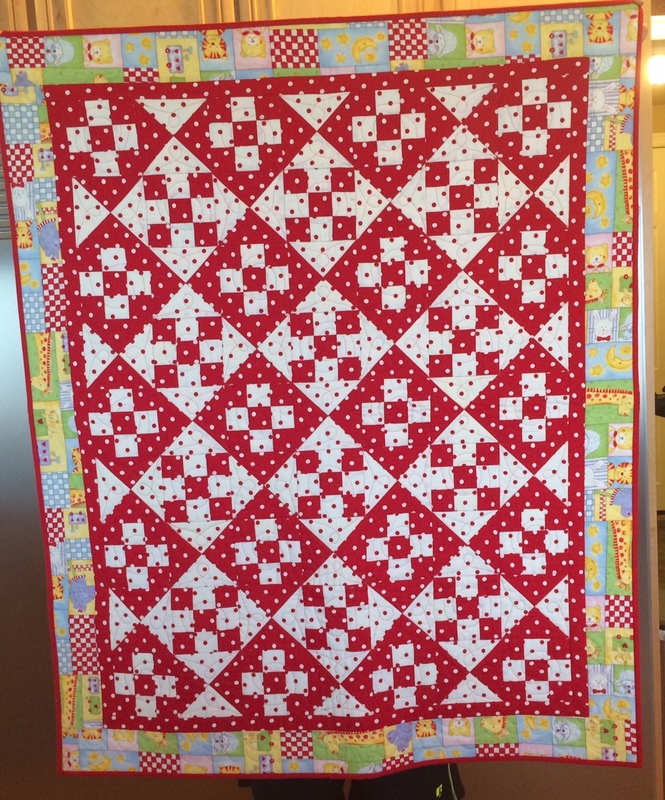 Well, because Freya’s daddy likes red, the next quilt I made was 9 patch and Hourglass, red and white polka dot. Tony loves it. 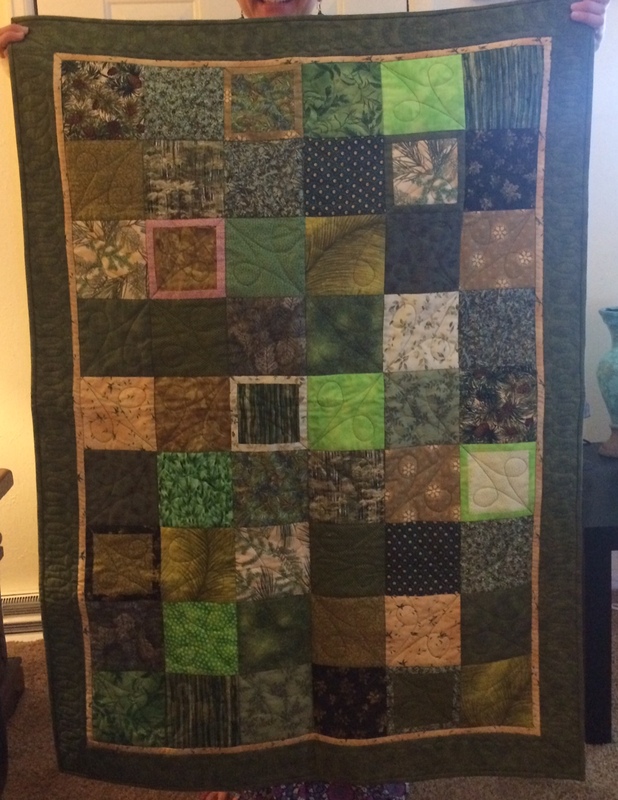 Both of these quilts are big enough to fit in the crib. 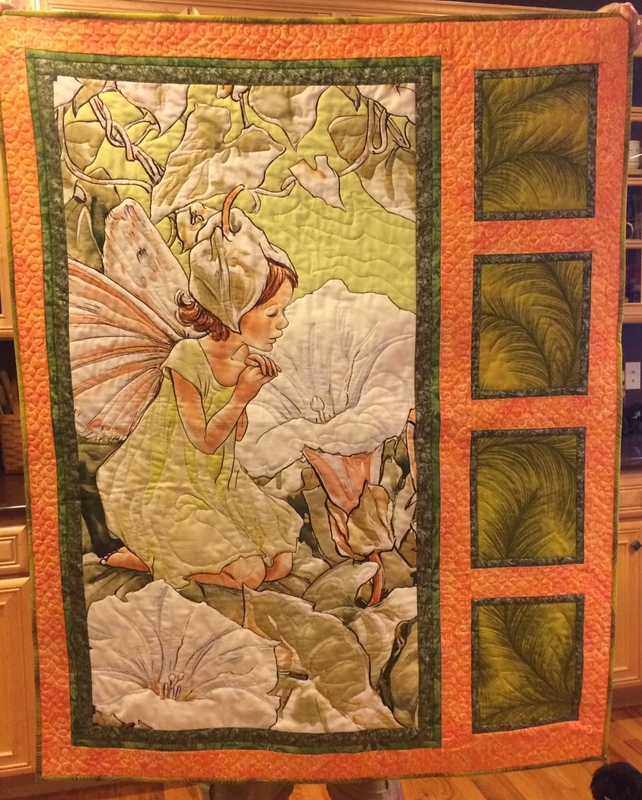 The next idea came when Lisa was at my house one day and she wanted to pick out greens for another crib quilt to match her “Enchanted Forest” theme. 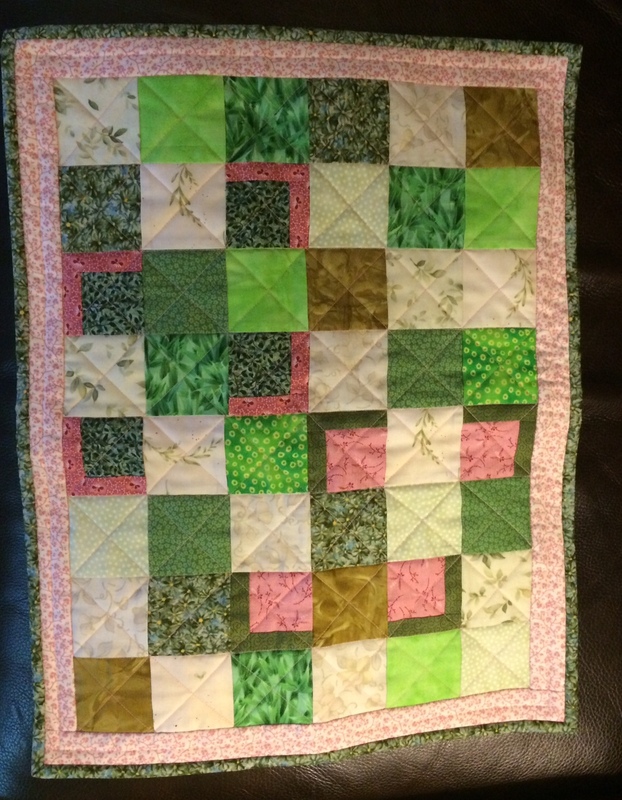 I told her I might sneak in a little pink since I think pink and green go together great but she limited me to only one little pink border around a green block. Can you find it? 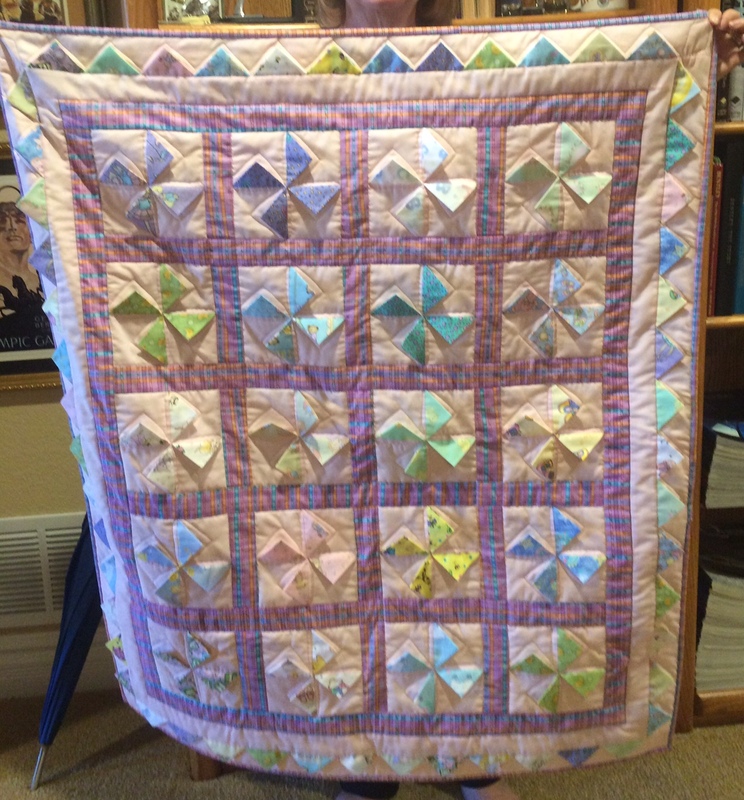 (I apologize that these are not the best photographs – I just took them on my phone, not really for publishing and now the quilts are at the baby’s house). teddy bear but since Lisa wasn’t there when I made it, I snuck in a little extra pink. 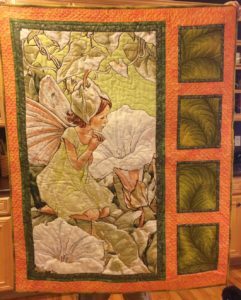 The last one I made is for the nursery wall and it has a Fairy to watch over her crib, so it hangs on the wall. It is a panel illustration from one of Cicily Mary Barker’s poetry books (early 1900s). I think I will read some of the poetry to Freya as she starts to grow and we will have Grandma reading time. I couldn’t end this blog without a picture of my new precious little one so here she is. Look at that. Her mom put her in pink! ← S is for Silk Yarn and Striped Fabric!